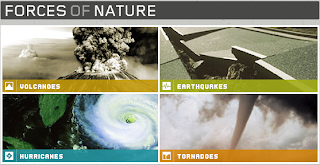 Forces of Nature is a film produced by National Geographic designed to educate students about volcanoes, earthquakes, hurricanes, and tornadoes. The Forces of Nature website provides a nice list of complete lesson plans for teachers of students in grades K through 12. Even if you can't get a copy of the movie, most of the lesson plans and activities are still very usable. Teachers of grades K through 6 may also want to check out the National Geographic Kids page titled Ten Freaky Forces of Nature. If you can't acquire the Forces of Nature film (available on Amazon $17.99), you may want to consider a similar film from National Geographic titled Violent Earth. Violent Earth can be viewed for free on Snag Films. Using Snag Films you can also embed the Violent Earth video into your blog, wiki, or website. I've embedded Violent Earth at the bottom of this blog post. Staying with the theme of forces of nature, Volcano World produced by Oregon State University has some great resources for teachers and students. I particularly like the virtual field trip through the Ape Cave lava tube at Mount St. Helens.